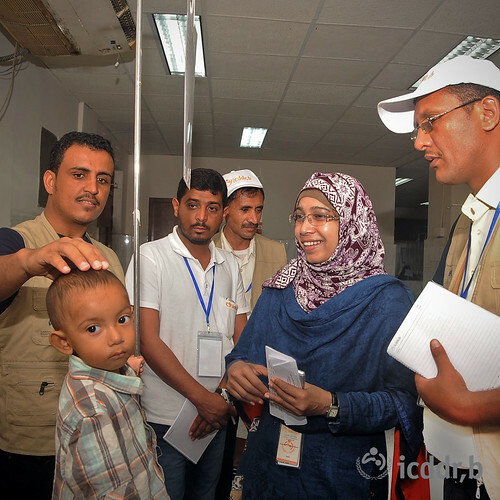 Physicians and nurses from war-torn Yemen visited icddr,b to learn expert knowledge needed to tackle cholera outbreaks. With support from the charity Kuwaiti Women Philanthropic Team, the visiting Yemeni health professionals participated in weeklong hands-on training on cholera and malnutrition case management at icddr,b’s Dhaka Hospital during 5-12 October. The team took valuable experience from icddr,b back home where hundreds of thousands of people were battling a countrywide cholera outbreak. Yemen had already endured over 750,000 suspected cases of cholera and the United Nations had said that Yemen represented the ‘world’s largest humanitarian crisis’. Slide left/right for more photos. The Yemeni team were trained with particular focus on outbreak control and prevention, surveillance methods, case management, and awareness on waste management and sanitation systems. They also observed management of cholera and other water diarrhoea, learnt about assessment of dehydration, severe acute malnutrition, food preparation, child feeding practices and community based management of illnesses. The Yemen team at icddr,b learns about theraputic food for children with severe acute malnutrition. icddr,b, as a founding member of GOARN, regularly deploys experts during emergency disease outbreaks worldwide to assist WHO and governments, including most recent visits in Sudan, Iraq, Syria and Ethiopia. “However, we could not arrange to send a team to Yemen due to security concerns this time,” said Dr Azharul Islam Khan, icddr,b chief physician and head of hospitals. In response to the Yemen crisis, the Kuwaiti philanthropy has sponsored the visit for these 20 Yemeni doctors and nurses for the training course at the world’s largest diarrhoeal disease treatment facility in Dhaka. According to WHO, during August 2017 alone, Yemen’s Ministry of Public Health and Population reported a total of 152,216 cholera cases including 117 associated deaths. The lack of infrastructure in the country coupled with the current humanitarian crisis has created ideal conditions for the disease to flourish. Violence in the country has displaced millions, who are now living with inadequate shelter, water, sanitation, and food. Afflicted by droughts and a lack of water, Yemen is considered to be among the most water-stressed countries in the world. Approximately half of all health sector facilities, including hospitals and clinics have been destroyed since the conflict escalated in 2016. The inauguration event on October 5 was also addressed by Mr Fayed OTN Al Shammari from the Embassy of the State of Kuwait in Dhaka, icddr,b scientists and doctors among others.